The company behind the Dakota Access pipeline and many other damaging fossil fuel projects — Energy Transfer Partners — was the focus of nearly 20 actions spanning 10 U.S. states last week. The #StopETP protests, which took place on Friday and Saturday, included a flotilla on a Louisiana bayou, a blockade of pipeline construction equipment in Pennsylvania and a demonstration outside the Texas home of CEO Kelcy Warren. 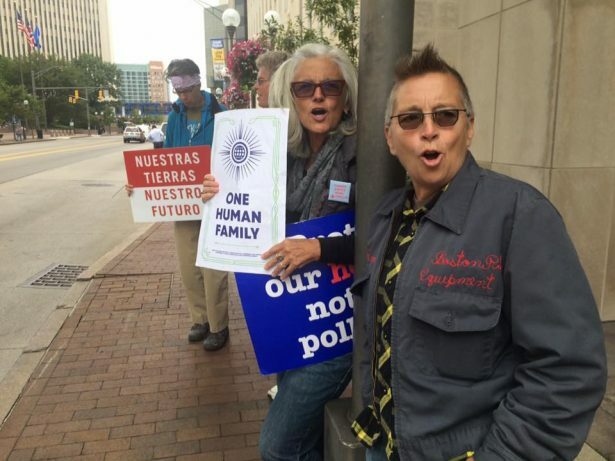 Orona explained that he and other activists in Texas spent weeks working with organizations and organizers throughout the country to create a weekend action against ETP. Even after the protest’s initial announcement more people joined in, holding their own events in solidarity. Orona pointed to a recent lawsuit filed by ETP against Greenpeace International and several other environmental groups — accusing them of “eco-terrorism” — as a reason why activists are uniting against the company’s “scare tactics.” At the same time, however, it was also an opportunity for them to highlight their local pipeline battles. 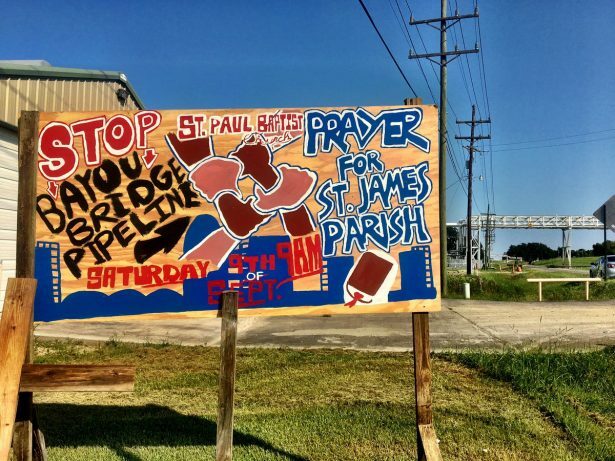 Anne Rolfes, national director of Louisiana Bucket Brigade, a non-profit environmental group, participated in an event where people prayed near the site of the Bayou Bridge pipeline — a project that would connect the Dakota Access pipeline to oil refineries in Louisiana. She said organizers took “this step in solidarity,” in part, after seeing nuns in Pennsylvania organize against the Atlantic Sunrise pipeline. Moreover, construction of the Bayou Bridge pipeline risks serious environmental problems, such as potential leaks or explosions that would affect wildlife and people near the wetland ecosystems. Such environmental hazards aren’t new to Louisianans. Communities near the Mississippi River are part of what’s known as “Cancer Alley,” a toxic stretch of oil refineries and chemical plants between Baton Rouge and New Orleans. Rolfes pointed to the recent climate-change-strengthened hurricanes in the Atlantic, as well as the catastrophic flooding in Louisiana and Texas, as further reason to act against the fossil fuel industry. Meanwhile, in Ohio, the group Keep Wayne Wild — which works to protect Wayne National Forest — participated in a series of actions across the state. They not only targeted ETP’s Rover pipeline, which would go through the state’s only national forest, but also the Bureau of Land Management’s plan to auction off parcels for natural gas drilling. The fracked gas from this drilling would likely flow through the Rover pipeline and pose a threat to communities in its path. 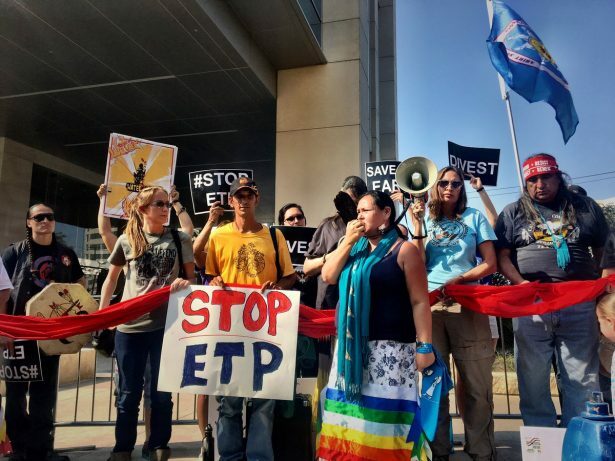 Keep Wayne Wild organizer Becca Pollard said she hoped the #StopETP protests alerted potential affected communities to the dangers of ETP pipelines, while — at the same time — put pressure on government officials to oppose fossil fuel-friendly policies and projects. “There’s a lot of decision makers in power who are not doing enough to protect the people they’re supposed to represent,” she said. On Friday, activists in Iowa made this point clear by delivering a petition to Gov. Kim Reynolds, demanding the removal of Richard W. Lozier, Jr. from the board of the state’s public utilities commission. In June, Lozier recused himself from any decisions involving the Dakota Access pipeline due to his past work with companies favoring the project. Weeks later, the board rejected an appeal to revoke the permit to build the pipeline. Pearson said that residents are ready to rejoin the struggle against the Dakota Access pipeline and pointed to a pledge of resistance that has gained over 2,000 signatures. She also noted that the Iowa Supreme Court will hear a case brought by the Sierra Club and local landowners appealing the commission’s approval of the Dakota Access pipeline. In that sense, the protests underscore the need to shift the nation’s dependence on fossil fuels toward alternative, renewable energy sources. Doing so would require corporations such as ETP to stop profiting off the future of people’s livelihoods. Brandon Jordan is a journalist based in Queens, New York, who has written for publications such as The Nation, In These Times, Truthout and City Limits. You can follow him on Twitter @BrandonJ_R. This article was published on September 11 at Waging Nonviolence.